The Second City’s hit holiday spectacle Miracle on Mercer St. returns, under the writing-direction of Reid Janisse and music by Glenn James. Filled with catchy musical numbers performed by energetic and talented puppeteers, this show is a must-see holiday feast! Following the Christmas of Oakville native Katie (Allie Price), the story launches from Union Station, bringing Katie to the puppet-filled small town of Hollydale, where her grandmother lives. Soon Katie discovers that Hollydale’s evil Mayor Bob Dodge has devices on the Town Square tree, the tallest in all of Canada! He wants to make room for his new parking spot and quash cultural debate before it starts. And he only needs one more signature on the petition: Katie’s grandma’s! Katie is a resolute Oakvillian, determined to preserve Christmas. So she takes to decorating the tree herself, when soon, all of the different puppet-natives of Hollydale step forward to contribute their own culturally-specific décor: a dreidel, an om sign, a crystal balancing rainbow, and a flying donkey, among others, each representing a different cultural group. Katie, learning about all of their different celebrations, learns a valuable Christmas lesson, however none of it is delivered with patronizing preaching – rather, with a whole menagerie of fun and colourful characters played by puppeteers Chris Bowman (Dr. Orange, Bahir, and others) Josh Murray (Jack, Mayor Dodge and others) and Mandy Sellers (Grandma and others). All of the puppets have the same round head, bug-eyes, and felt skin, just in different colours and clothes, but they are each given huge personalities and character traits and seem so fully developed in each of their ways, and the humour is apt and fresh. It is a totally mesmerizing experience. This colourful comedy will so please the adults that they will forget they’re watching a children’s show. One little girl in front of me and my friend Adam kept turning around to look at my companion because he couldn’t control his laugh-out-loud exuberance. And though it only seemed that some of the humour was too subtle for kids, there is nothing subtle about the physical comedy of the puppeteer of which the performers are masters. The cast held the all-ages audience in rapt engagement for a full sixty minutes solid, with the minor exception of one or two little ones who seemed to want to claw their way onto the stage – nothing the parents couldn’t handle. 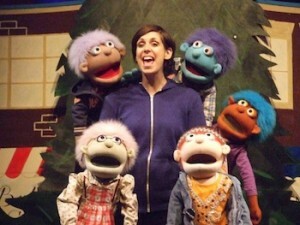 Photo of Allie Price and her puppet friends courtesy of the Second City.